We're suckers for great facial hair, and this, this, ladies and germs, is how you do a beard. One of the crewmembers on the Austin-based CJ Wilson Racing team knows the ways and secrets of The Beard. This is by far the best beard I've seen in the paddock. 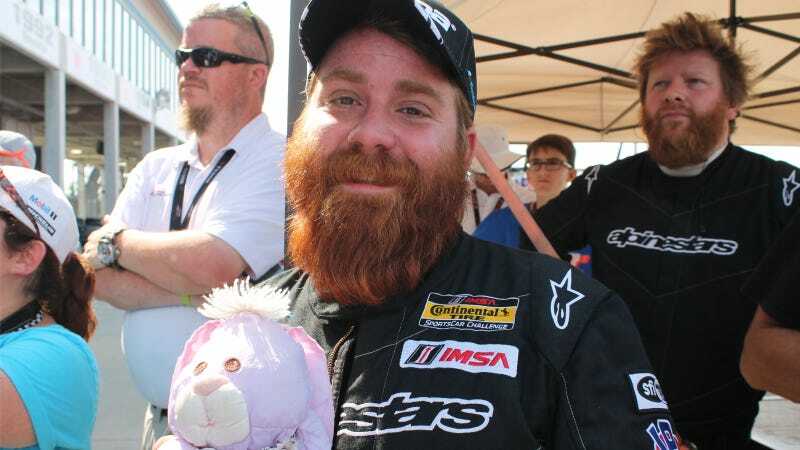 The team's MX-5 driven by Chad McCumbee and Stevan McAleer claimed third in the Continental Tire Sports Car Challenge race, and I think it's safe to say that this epic beard propelled the car further and faster on a cloud of fluffy win. It's thick. It's fluffy. It's reddish brown. It's a style of beard that's clearly descended from vikings and wild mountain men, and has now made its way into the business of wrasslin' race cars. It's everything a stuffed rabbit who serves as a race car scapegoat/bringer of good fortune could use to nest in for warmth. I dare you to find a better beard this weekend than this crew guy's. Bonus: this guy recognized my Puffalump bunny because he had one. Boom. The Puffa-bump strikes again, this time with a podium finish.